On October, 9, 2014, I decided to image the waning gibbous Moon. My main motivation was to capture the Moon at close to the full phase for a friend of mine, but I also took the opportunity to make a time lapse video of the Moon’s movement. I first imaged the Moon exposing it for 1/160 of a second, at f/5.6 and with an ISO of 100. After looking at it, I reduced the exposure time to 1/200 of a second, and stopped down the aperture to f/8, which gave me an image with better contrast between the mariae and mountainous areas. I had a great and productive time that night. 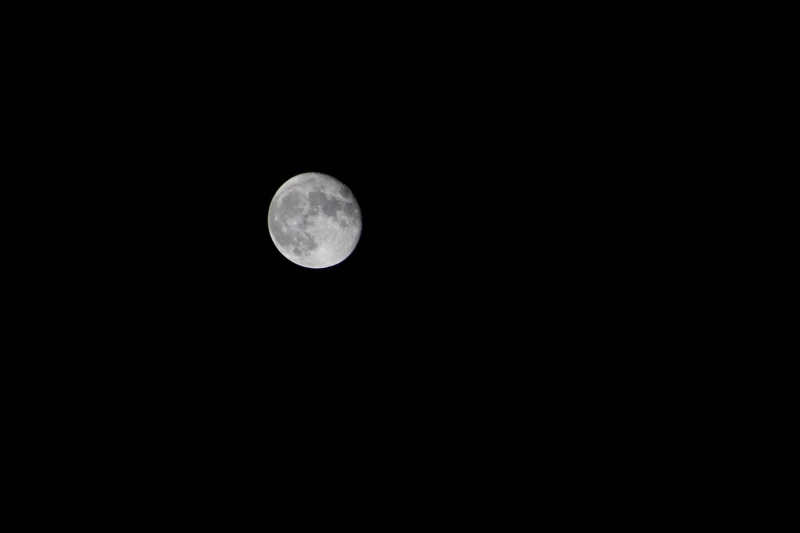 I got a lot of pictures of the Moon, and I have another timelapse video to share. I hope to have more productive nights like this in the future. Keep looking up! You never know what you’ll find up there. 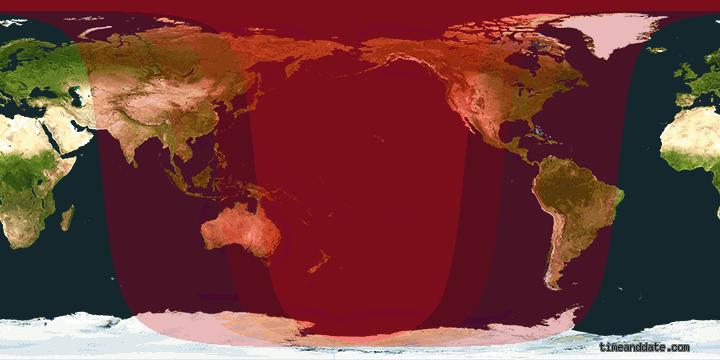 On October 8, 2014, a lunar eclipse occurred in North America, and Oceania. This eclipse is the second of four consecutive total lunar eclipses occurring in 2014-2015. 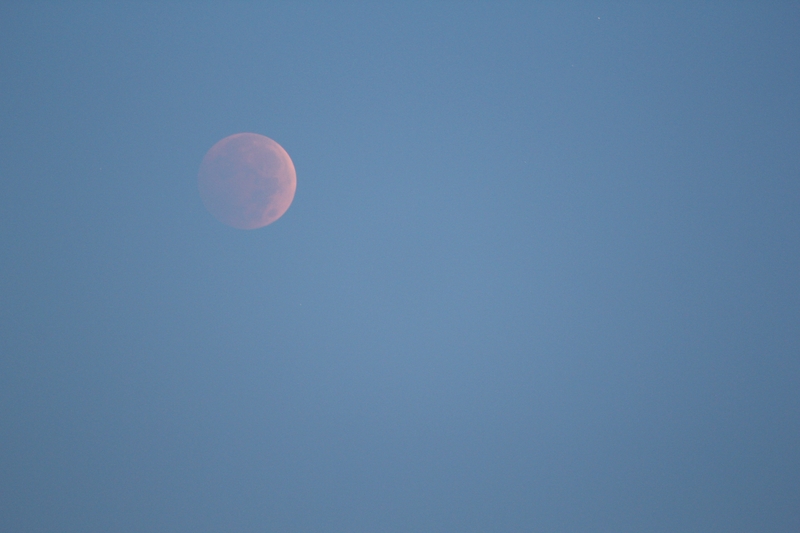 I missed the first eclipse because that night in Toronto was overcast with a thick cloud. 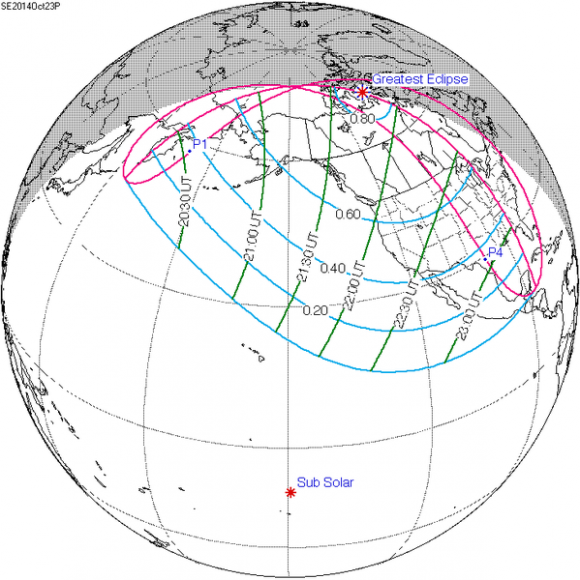 On that night, the forecast looked bleak with clouds clearing only around 6-7 am, when the eclipse was underway. Some forecasts say that it would remain cloudy for the whole night. 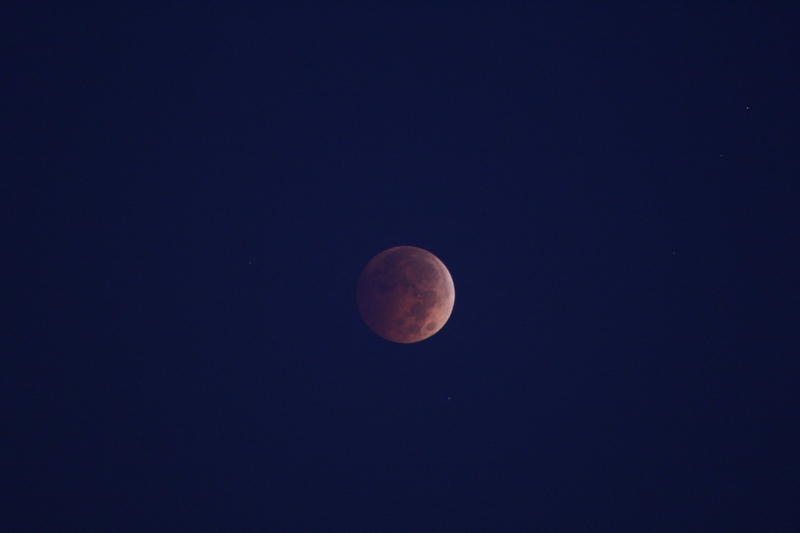 Despite the high probability of cloud, I decided to go and observe anyway. I arrived at the bus depot near the Markham Fairgrounds at 5:00 am. It was completely overcast, although there was a break in the clouds at that time. In that break, I believe I saw the beginning of the eclipse at that time, but I am uncertain about that. After I captured a few shots of the Moon, the clouds covered the night sky. After waiting a while for the clouds to clear, I elected to leave that area and come back in 30 minutes, once the clouds cleared up a bit more. However, on the road back home, I saw a significant break in the clouds and I drove back to the spot. When I arrived there, the clouds opened up slightly to reveal some of the stars. In the distance, I saw a sort of divide between the clouds and what I assumed was another set of clouds. As the clouds moved eastward, I noticed that the divide was an opening between the clouds and the sky. 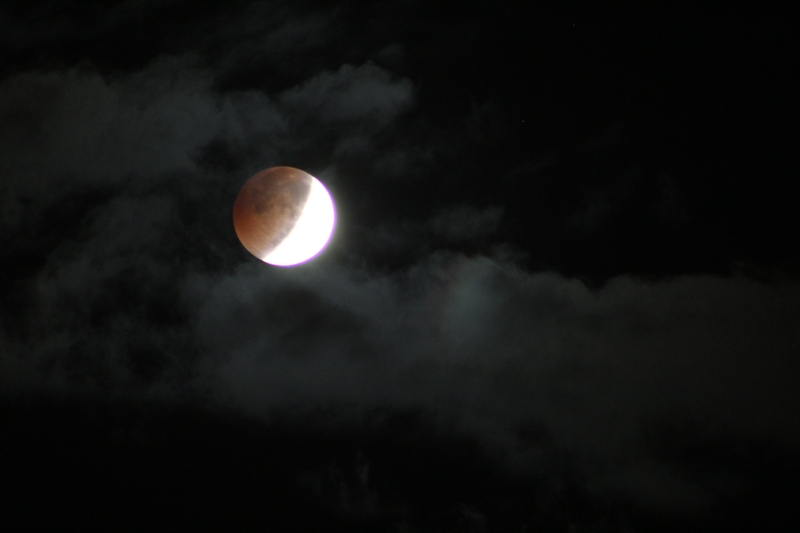 Eventually, the clouds moved far enough that the eclipsing moon became visible. I soon began imaging it playing around with the settings, experimenting with what created a great image and what created a flawed image. 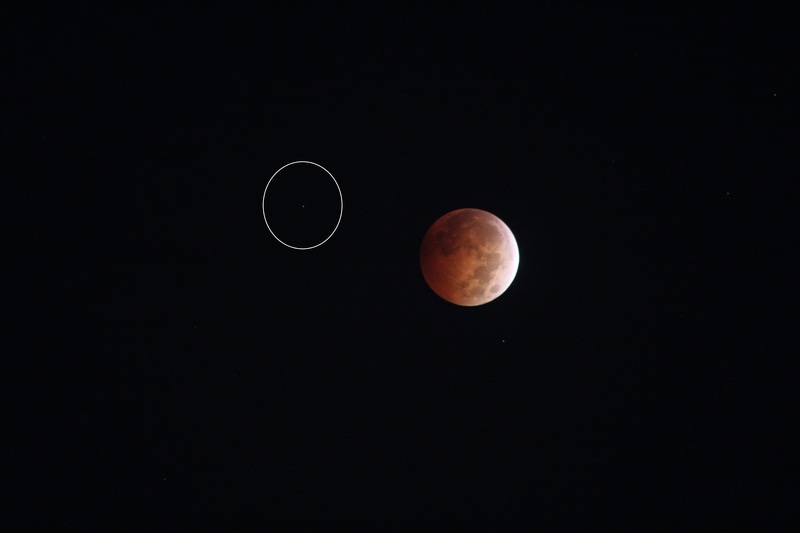 It was an amazing experience to not only capture but to view a lunar eclipse. 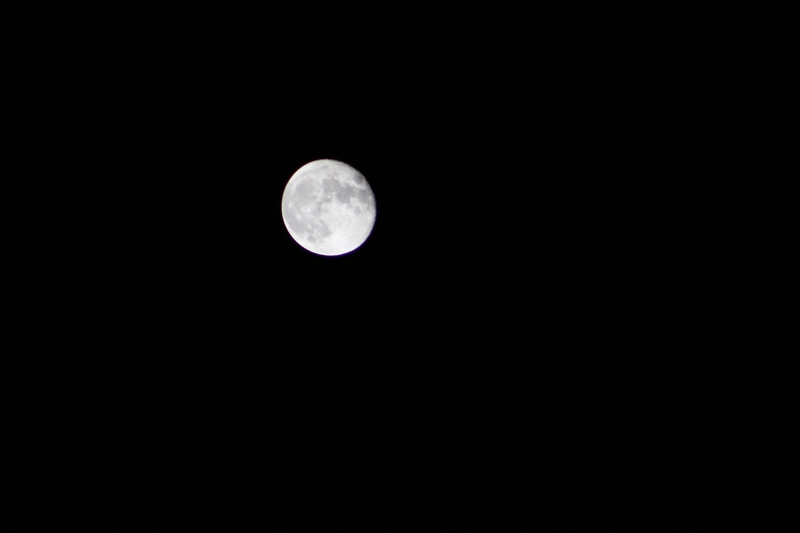 As the Moon descended towards the atmosphere, I decided to get a clearer view of the horizon. I grabbed the camera and headed into the Bus Depot. There, I got a clearer view of the horizon, and the eclipse as well. The eclipse lasted for many hours until sunrise. As the Moon descended deeper into totality, the sun starts to rise, which obstructed the view of the Moon in totality. At around 7:05 pm, I couldn’t see the Moon anymore. At that time, I decided to go back home. Looking at the photographs, I also realized that I may have imaged Uranus as well. I compared the image I took with Starry Nights planetarium software, and I couldn’t confirm whether I imaged a star or Uranus with the reddening Moon. I then compared my image with another person’s image, and I saw that there was a blue star near the moon in a similar position to the other person’s image. There were other stars, but they were not a sky blue. I suspect it is Uranus, but I cannot be sure. 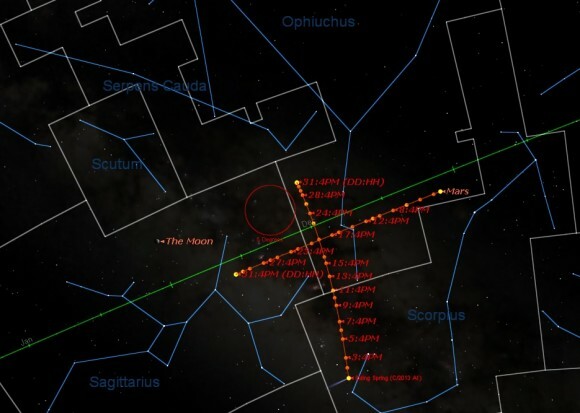 6:26 AM with Uranus circled. Whoever saw the eclipse, in Toronto, were lucky that the clouds cleared up. I had a great time imaging the eclipse. I invite anyone who saw the eclipse to share their experience on the comments section below. On September 27, 2014, my father and I drove to Glen Major Forest in Clairmont to image the night sky. The sky was so clear, that we could see the Milky Way ever so slightly. We quickly set up the camera on a standard tripod. The camera had a 10 mm wide angle lens. After fiddling with the image settings, we decided to take 30 second exposure images at f/4 and ISO 1600. I set up the intervalometer to take consecutive images for as long as it can. It started imaging at around 10:00 pm. My father and I left the camera alone to do its work. During that time, we talked about the telescope, and how we can repair the tracking problems. We formulated a plan to fix the telescope’s tracking abilities, and hopefully we will be able to get the best result from that plan. At 10:52 pm, we checked the camera and we realized that the battery died. As a result, we packed up and drove back home. We came back home with 81 frames to use for the image I had in mind. The next day, I stacked all the pictures using a program I downloaded from Startrails.de. This program stacks the images that one loads into the program and creates an image. This program doesn’t adjust the image in any way, therefore, it creates what is known as a startrails image. These images below used two different methods of post processing. For the first image, I used FastStone Image Viewer to convert all the images from .CR2 (Canon Raw File) to JPEG files, which I used to create the startrails image below. 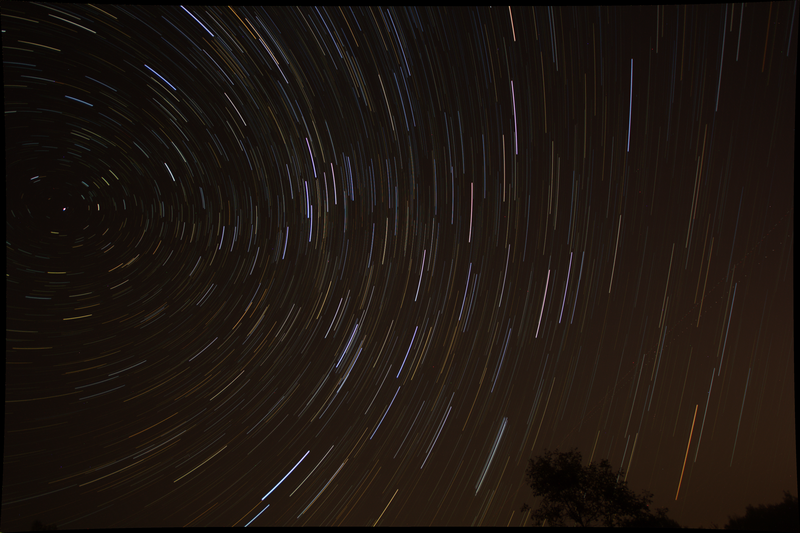 For the second image, I used UFRaw to convert each image into TIFF files, which I used to create the startrails image. This startrails image below is darker than the first image because of how UFRaw processed each image. 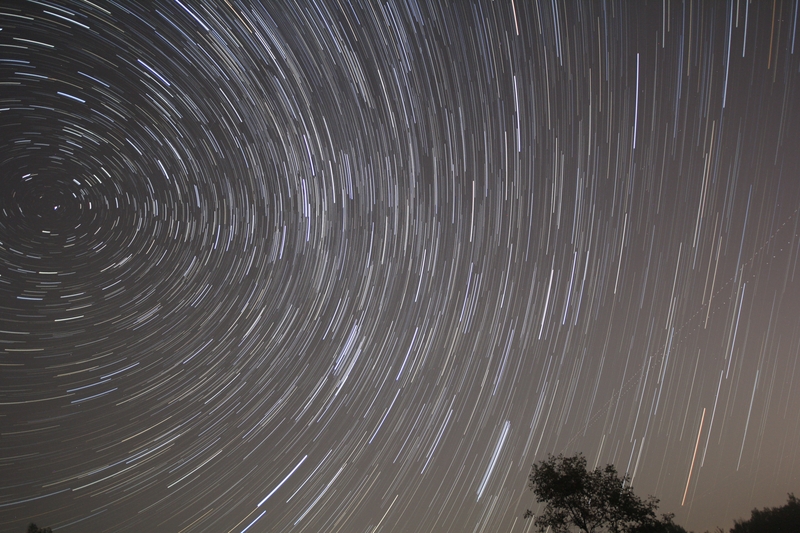 In addition, I also made a timelapse video of the stars’ movement in the sky. It felt astounding to see the actual movement of the stars in the video I made. This is one of the many kinds of images that you can capture with a DSLR camera. The night sky is full of amazing objects and phenomena that always makes the heavens a dynamic place to image. On Thursday, September 25, 2014, RASC hosted its monthly dark sky party at Long Sault Conservation Park. After all my work was done for the day, I decided to take the 45 minute drive there. I arrived at Long Sault Conservation Park at 11pm. Most of the observers have left, with only a few left. Looking up at the sky, I saw so many more stars than at home. I also saw the Milky Way. Unfortunately, the Galactic Center was not visible at that time. I met whoever were left, and I saw what they were seeing. They were doing amazing work. One observer, who came from downtown Toronto, showed me his setup. When I met him, he was looking at the Andromeda Galaxy. He let me peek at Andromeda through his telescope, and I saw a dull, fuzzy, and dim dot. It was barely visible. I stayed until 11:30 pm, looking up into the sky, staring in awe of the beautiful, Milky, stream of stars in the sky. After that, I left for the long drive back home. While my trip was short, it was fruitful. I finally saw how beautiful Long Sault Conversation Park is, and I saw the Milky Way. I hope to one day come back with my telescope and take more photos of the night sky there.